This is a great favourite for BBQ picnic. Rather expertly, the Singaporeans crunch the whole prawn, sucking in all the tamarind flavouring, while spitting out the bits of shell. some salad of your choice eg. lettuce, tomatoes, cucumber slices etc. Devein prawns, trim feelers and legs, but keep shells on. Rinse well, pat dry and, using a sharp knife, make and incision along the curve of the tail. In a bowl, mix together tamarind paste, soy sauce, sugar and black pepper. Pour mixture over prawns, rubbing it over shells and into incision in tail. Cover and let marinade for 1 hour. Prepare charcoal grill. 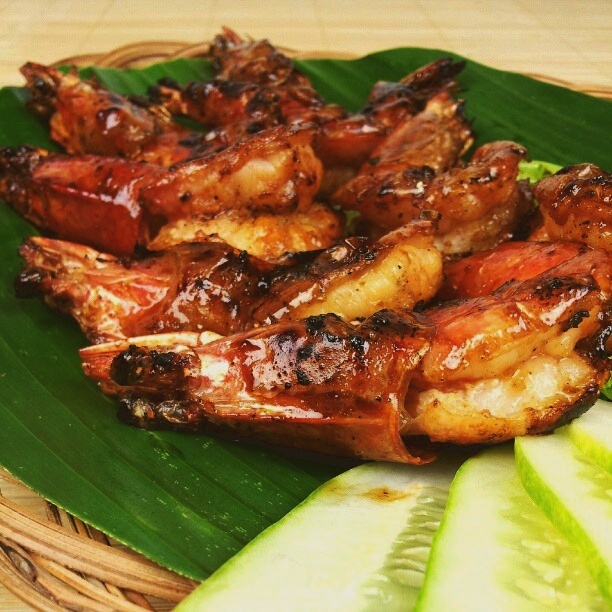 Remove prawns from marinade and place on rack over charcoal grill. Grill prawns for about 3 minutes on each side, brushing them with marinade as they cook. Serve them immediately with coriander and green chillies to chew on. Wah…going to try these with big prawns! I think this is a great tip for me for this Saturday. Tks chef!